Not only does your air indoors need to be heated and cooled it also must be filtered and cleaned. The quality of your indoor air can directly affect your health and well-being. Therefore, we offer a variety of clean air and other quality of life accessory products for your health and home. Please see our full line of the following beneficial indoor air products you may not have been aware of. Indoor air quality should be a top priority for your family. Most people believe that their heating and cooling system is already cleaning their air. But in fact, it may be making it worse, not better. That’s because most systems are equipped with a standard 1” air filter, which is designed to remove debris like pet hair and feathers from damaging equipment. 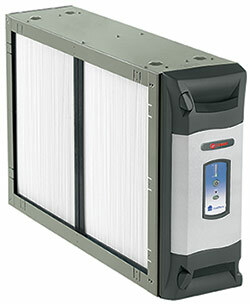 So whenever your system is on, it churns up allergens and circulates them throughout the home. Your home deserves a true air cleaning solution. Trane CleanEffects™ utilizes patented, breakthrough air cleaning technology to remove up to an astounding 99.98% of airborne allergens from the air that passes through the filter. It catches particles as small as .1 micron, making it 8 times more effective than even the best HEPA room filters and up to 100 times more effective than a standard 1″ filter. Trane CleanEffects™ has been performance-tested by LMS Technologies and Environmental Health & Engineering, Inc. (EH&E), with the results verified by professors from the Harvard School of Public Health, so you know you are getting an air filtration system like no other. Connect your ComfortLink™ control to a matched Trane system for complete, seamless comfort. Every component is designed to work in harmony with the others, optimizing your energy use over time. Many of the grilles and registers in older homes were designed for lower airflow heating-only systems. Most are stamped-faced and offer few options for controlling airflow direction, or higher-airflow on new air conditioning systems. 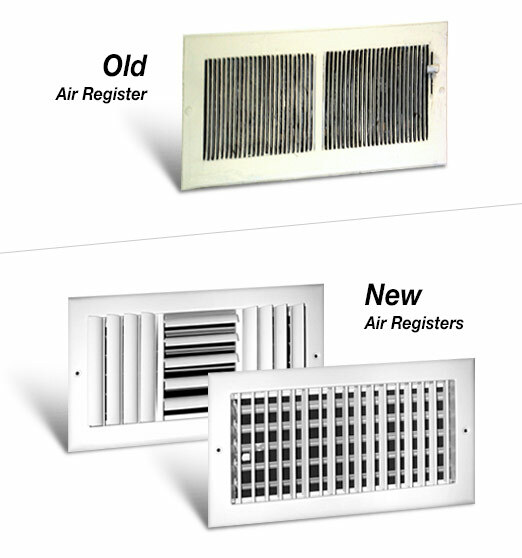 New grilles and registers can provide precise and quiet air volume control with a smooth operating multi-shutter damper. Energy-efficient home construction has resulted in increasingly “tight” homes – structures that reduce the amount of fresh air exchanged through cracks around doors, windows, ceilings, and roofs. When odors, chemical vapors and naturally occurring gases like CO are locked in, indoor air becomes stale, creating a less healthy living environment. A Trane ‘Fresh Effects’ Energy Recovery Ventilator (ERV), provides whole-house fresh air ventilation year round by exhausting stale indoor air and bringing in an equal amount of fresh outdoor air. Does your air inside your home feel dry or parched? Dry air absorbs moisture from furniture, wood floors, and musical instruments. Static electricity is a frequent annoyance. Whether you live in an area with winter conditions, or in an area where the climate is hot and dry, humidifiers are designed to add just the right amount of moisture so you can be comfortable. Carbon monoxide is an odorless, tasteless, invisible gas. Carbon monoxide results from the incomplete combustion of fossil fuels, such as wood, kerosene, gasoline, charcoal, propane, natural gas, and oil. Carbon monoxide detectors trigger an alarm based on an accumulation of carbon monoxide over time. Carbon monoxide can harm you if you are exposed to high levels of carbon monoxide in a short period of time, or to lower levels of carbon monoxide over a long period of time. The AirScrubber Plus® utilizes proprietary ActivePure® technology shown to substantially reduce odors, visible smoke in the air, and contaminants on surfaces*. ActivePure consists of a special UV light and photo catalyst target, which creates an Advanced Oxidation Process containing several friendly oxidizers.